April 15th shouldn’t be an overly taxing day, not when you’ve got the perfect excuse to pig out. It’s National Glazed Spiral Ham Day! Or, another in our list of very specific and odd food holidays. 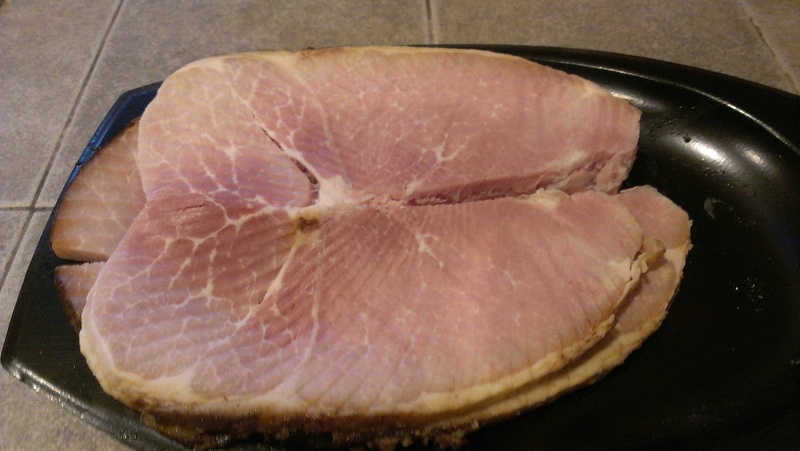 Ham is a cut of meat that comes from the thigh of the pig. Pork was traditionally cured in the fall and would be ready to eat in the springtime. Ham is closely associated with Easter because it is considered a symbol of luck, and since Easter often lands in April, the middle of the month is an ideal time to celebrate this tasty porcine product. In 1937, a Detroit resident named Harry J. Hoenselaar, working in his basement, invented a special way of cooking, slicing, and glazing ham. He patented his spiral slicing machine and tried to market it to various companies, but nobody went for the idea whole hog. Undaunted, Harry decided to open his own ham store, and formed the HoneyBaked Ham company in 1957. The machine is attached to a ham on the top and bottom and a rotating base is gradually lowered as a blade is applied to the meat, resulting in perfectly uniform spiral slices of ham cut through to the bone. HoneyBaked ham became a sensation, winning over legions of fans who love their signature tender and juicy ham with a crunchy honey glaze. I too am a big fan of HoneyBaked ham, and immediately thought of them when this holiday rolled around. So Tara and I drove out to Clackamas Town Center on Saturday to stop by the HoneyBaked Ham store in the mall. As delicious as HoneyBaked ham is, it’s also expensive; the smallest “mini” ham still cost $32, and would have been a lot of pig for the two of us to tackle. Fortunately, they sell their glazed spiral ham already sliced by the pound, so we picked up a package of that. HoneyBaked ham is so good, it seemed a waste to just slap it between two slices of bread and call it good, so we made ham and eggs for breakfast instead. Delicious! I hated ham growing up…ham and lima beans…gag! But wait…I grew up and now love the stuff. Ham and eggs is delicious!! Funny you should say that. Lima Bean Appreciation Day is Saturday!